Richard Vevers relaxes on the back porch of Saturdays Surf, a hybrid surf and coffee shop in the uber-hip SoHo neighborhood of Manhattan. It’s a fitting dry-land venue for meeting Vevers, the charismatic director of a groundbreaking project to extend Google Street View imagery to the climate-sensitive coral reef ecosystems of the world, with potentially huge benefits for scientists. Surrounded by surfboards, he sips a cappuccino and describes why he traded in loafers for flippers, making an improbable career switch from advertising to photography. 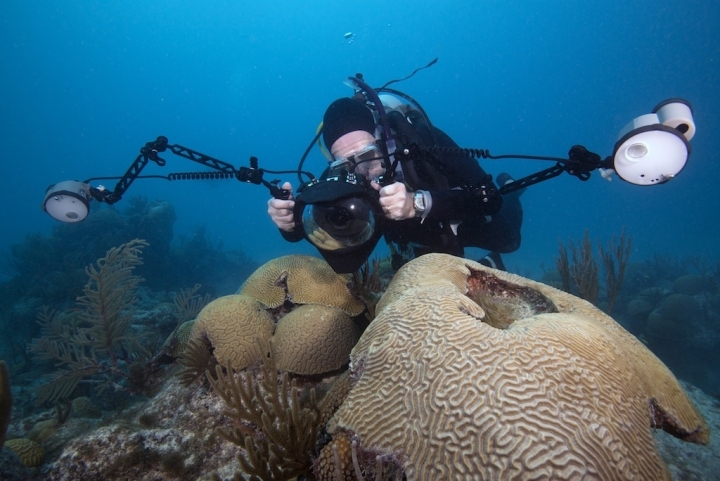 Over 10 years of photographing reefs, he saw signs of failing reef health due to ocean acidification and warming-related “coral bleaching” events, plus environmental stress from pollution and overfishing. Fish swirl around a reef near Lady Elliot Island, part of the larger Great Barrier Reef. Click image to enlarge. He says the last bit matter-of-factly, but it’s a daunting goal. Out of this mentality began the Catlin Seaview Survey, which he launched last year in partnership with Google and the Catlin Group, a reinsurance company that has a history of sponsoring environmentally-related scientific expeditions. Other partners have come on board as well. Relying on 21st century technology and a public-private partnership, Vever’s team is on their way towards meeting their goal of creating the most comprehensive database of coral reef health on the planet. The high definition images and data are freely available to scientists, conservation managers, and the public and will provide a comprehensive baseline of how climate change is affecting some of the world’s most sensitive ecosystems. That’s because 75 percent of reefs are under threat from factors such as pollution and overfishing as well as global increases in ocean temperatures and acidity, according to a World Resources Institute study. That number is projected to increase to 95 percent by 2030 and nearly 100 percent by 2050 as the oceans continue to warm and become more acidic due in large part to manmade greenhouse gas emissions. This potential ecological catastrophe could become an economic one as well, particularly for tropical countries that rely on tourism dollars and fishing. That’s because reefs offer more than just spectacular scenery. Sea lions play and pose for the camera near the Galapagos Islands. Click image to enlarge. According to Vevers, 500 million people rely on reefs for fishing and tourism. The National Oceanic and Atmospheric Administration estimates that coral reefs provide net economic benefits of $9.6 billion a year for tourism-related activities and $5.7 billion a year for fisheries. Most of the people who benefit from the bounty of reefs are in small island developing nations, where limited opportunities mean reefs provide outsize social and economic benefits. Reefs also provide an important line of defense when it comes to storm surge from hurricanes. For example, in the wake of Hurricane Sandy, landscape architects have proposed using oyster reefs to protect New York from devastating storm surges. Despite so much riding on reef health and the dire outlook, Vevers is hopeful that the survey will raise public awareness about the natural underwater infrastructure, and provide valuable baseline data to help scientists and the public understand which components are both most vulnerable and most resilient to rising ocean temperatures and acidity. Vevers developed the project in 2010. He had been out of advertising for a decade, having left London for Australia to pursue his passion for underwater photography. Like a modern day Captain Nemo, Vevers explored the world below the waves using the latest in underwater photography gear. However, unlike his “Twenty Thousand Leagues Under the Sea” counterpart, Vevers wanted to share his findings with the broader public, only a small fraction of whom will ever experience reefs firsthand. These efforts evolved into their current state when Vevers realized that no global baseline data for coral reef health existed. In addition to providing stunning imagery for the public, he wanted to provide useful data for scientists. Vevers found ready partners in Catlin, as well as the Global Change Institute at the University of Queensland, who helped provide scientific expertise. A trio of turtles swim through a part of the Great Barrier Reef near Heron Island. Click image to enlarge. To ensure the data and images are standardized and collected in a timely manner, the Survey has reimagined the whole process from collection to analysis to public engagement. The new process is light years beyond the traditional tools of reef science. The most common way for researchers to do visual studies of coral reefs is also very much grounded in tradition, rather than innovation. “The old method was measuring with a ruler and taking a still picture,” Vevers says. That may sound like an oversimplification, but it’s fairly close to reality. Traditionally, scientists have donned wetsuits and taken the plunge into tropical waters to measure reefs armed with a ruler, a camera, and a line of chain to measure the dimensions of their sample. To take measurements, scientists would put the ruler down on a section of the reef for scale, capture a single still photo, move down a transect, or straight line, and repeat the process. Researchers also often employ 30 feet of chain over the surface of reefs to get a rough sense of their contours. Using this method, scientists can cover a 100-yard transect on a good day, Vevers said. The tedious nature of the process should make it pretty clear why there’s no comprehensive record of the world's reefs. To overcome these constraints, Vevers turned to 21st century technology. At the surf and coffee shop, Vevers pulls up a picture to show what the Seaview Survey’s updated take on the process looks like. His answer to the pencil, camera, and chain is a camera that looks like a 6-foot long microphone. But instead of capturing sound, it takes high-definition video and images, records GPS coordinates, and readings of the topography. Vevers explains that it’s propelled forward at a constant speed about 2.5 mph, with GPS keeping it on a straight line. The head has three fisheye cameras, similar to those used by Google Street View. They capture a photo once every 3 seconds and provide high-definition images of what’s around, above, and below the sled that can later be stitched into a panorama. Lasers take detailed readings and two smaller cameras mounted on the bottom of the contraption capture 3-D images that replace the chain and ruler. “It’s got frickin laser beams,” Vever jokes, doing his best Doctor Evil impression. All this allows his team to map up to 3.75 miles in a day. For Vevers, actually pulling this off and seeing over 20 times what he normally saw on a dive was an “aha moment” that he and his colleagues were onto something. So far, they’ve captured 200,000 images from the Great Barrier Reef and parts of the Caribbean. Those images form the backbone of the Seaview Survey’s latest project, the Global Reef Record. The Survey has plans to visit six other coral hotspots around the globe in the next 2 years to complete their baseline survey. The Scripps Institution of Oceanography has also come on as a partner recently to help analyze the images and identify coral species. What’s been done in the past with the human eye is now being done by facial recognition software, Vevers said. “It would take 10 years of going through these images to analyze the data,” Vevers says. The facial recognition software can “analyze images in hours rather than years,” he said, and has a 90 percent accuracy rate. A diver from the Catlin Seaview Survey swims with a ray in the Great Barrier Reef. Click image to enlarge. All of this means the reef record is shaping up to be the equivalent of going straight from a landline phone to an iPhone 5S. Except instead of pleasing technophiles, there’s a treasure trove of information for scientists. Hoegh-Guldberg also notes the record could be used to track invasive species such as lionfish and make management decisions on how to protect other reef species. Having a broad cross section of reefs in the database also opens the door for making comparisons to understand what makes some reef species resilient, and tease out how local vs. global factors are affecting reef health. “The hope going forward is we can use this beautiful, comprehensive, high-definition video surveys and use this footage to determine some of the ecological indicators we would like to check, like number and diversity of fish, the size of colonies, the diversity of colonies,” Kim Cobb, a Georgia Tech scientist whose research focuses on past and future changes in Pacific reefs, said in an interview. Ove Hoegh-Guldberg, chief science officer of the Survey and Director of the Global Change Institute at the University of Queensland, on a dive in Bermuda on September 22, 2013. Click image to enlarge. Another unique aspect of the Survey is its ability to respond rapidly to ongoing events. While Vevers chatted with Climate Central in New York, Hoegh-Guldberg was in Bermuda with a Survey team to document a “Level 1 coral bleaching alert” in the region. In plain English, that means that coral there are at risk of bleaching and potentially dying due to warmer-than-normal ocean temperatures. According to Hoegh-Guldberg, water temperatures were 1.8°F above normal, but that small shift was enough to start bleaching in tiger corals. He says the Caribbean has to deal with more local human impacts, such as overfishing, in addition to global ones like rising ocean temperatures and acidification than does Bermuda. “It’s (Bermuda’s) a sentinel. But when you look at models, the Atlantic will be 2°C (3.6°F) warmer by end of the century. In the longer term they (the reefs) will be hit very hard,” Hoegh-Gulberg says. Having snapshots along the way will provide valuable information to scientists of how reefs respond to warming and recover — or don’t — afterwards. Cobb also sees the usefulness of this approach in looking at changes that happen on a semi-yearly basis. To illustrate, Vevers opens a video Google made about “Sea View.” In the video, all the familiar parts of Street View are there: 360° panoramas, the ability to zoom in and out, and move down the street. However, sea turtles, unique coral formations, schools of fish, and deep blue water make for scenes that are anything but what you’d find on your average city street. Rather than hiding the data and images in an obscure location, Catlin Seaview Survey has partnered with Google to include underwater 360° panoramas in its Street View service. Users can take “virtual dives” to see places sometimes only a small handful of people have seen. “It (Google) has a pulling power and I was blown out of my chair. You’re lucky if you get 1,000 readers of your work in peer reviewed journals,” Hoegh-Guldberg says. With Google, Hoegh-Guldberg says the Survey’s work has the power to reach 1.2 billion people that use Google Maps each month. Vevers has already seen the “Google Effect” on a cab ride when the driver told him he’d been on a virtual dive. Getting the public interested in reefs is a first step to getting them engaged in understanding the long-term changes that are expected to occur and taking actions before they happen.